Paul Schweikher (left) and Winston Elting (right) in 1946. Robert Paul Schweikher (1903–1997) was born in Den­ver, Col­orado in 1903 to a fam­ily of musi­cians. He orig­i­nally trained at the Uni­ver­sity of Col­orado for a year (1921–22) before mar­ry­ing his wife Dorothy. He moved with her to Chicago, Illi­nois and stud­ied at The Art Insti­tute of Chicago while work­ing for the firm Lowe & Bol­len­bacher. Schweikher worked his way up from a clerk to a con­struc­tion super­vi­sor. After two-and-a-half years at the firm, Schweikher left to join David Adler’s prac­tice. Among the projects that Schweikher worked on was William McCormick Blair Estate in Lake Bluff, Illinois. He later stud­ied at the Armour Insti­tute of Techonol­ogy before again trans­fer­ring to, and receiv­ing a degree from, the Yale School of Archi­tec­ture. He returned to Chicago after his school­ing in 1930 and estab­lished a prac­tice with Fred Keck and Philip Maher. He quickly rose to promi­nence, and his works were included in an exhi­bi­tion at the Museum of Mod­ern Art in 1933. His work was also exhib­ited at the Cen­tury of Progress Inter­na­tional Expo­si­tion. Schweikher joined the prac­tice of Lamb and Elt­ing in 1934 (later renamed Schweikher and Elting). In 1953, Schweikher was named chair­man of the Yale School of Archi­tec­ture. Five years later, he resigned from the uni­ver­sity to take a posi­tion as head of the Carnegie School of Archi­tec­ture in Pitts­burgh. He retired in 1970 and moved to Sedona, Ari­zona, where he opened a small prac­tice. Schweikher passed away in 1997. The Art Insti­tute of Chicago has an oral his­tory with Paul Schweikher avail­able online as part of the Chicago Archi­tects Oral His­tory Project. The David Johnson house is located at 6956 S. Bennett Street in Chicago. Completed in 1936, it sits squarely within the same period and sentiments of Schweikher’s own home and studio completed in 1938. While two stories tall, rather than Schweikher’s single story home, similarities still abound with the low-sloped roofs and wide overhanging eaves, large windows, and the use of wood and brick. The David Johnson house is a contributing structure to the Jackson Park Highlands Chicago Landmark District. 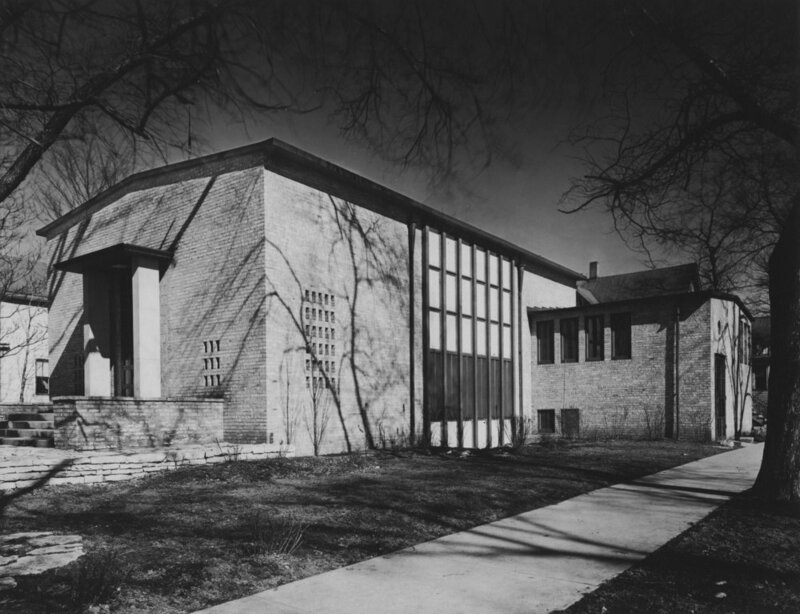 Schweikher completed the Third Unitarian Church in 1936. By 1963, the Architects Landmarks Commission chose this site as an architectural landmark, three years after the building was granted official landmark status from the City of Chicago. The congregation has been active since 1868, but by the 1930s they were looking for a new home with this structure constructed at 301 N. Mayfield Avenue in Chicago. Just as the congregation has described itself as progressive and open, so too is the architecture of the structure. The church is built primarily out of brick. In the later half of the 1930s, L.D. Kern, part of a prominent farming family in what was then Roselle, commissioned his friend Paul Schweikher to redesign his home. When Schweikher came to look at the house and grounds, he instead fixated on a barn that pre-dated the Civil War, turning it into a lavish 14-bedroom home for the Kern family. In the late 1950s, the Kerns sold the home to Bob Atcher and his family. Atcher had a successful country music career, serving as the master of ceremonies for the WLS Barn Dance, a local show that served as the forerunner to the Grand Old Opry. Atcher was also the first Mayor of the Village of Schaumburg, serving the village for nearly 20 years. Unfortunately, the Kern Atcher Barn was destroyed in a fire in 1963. Newspaper reports at the time interviewed Atcher after the fire, where he notes that the 22-room home sustained more than $200,000 of damages. The blaze was so fierce that firefighters came from numerous neighboring communities, only to find the home already all but lost. In 1939, Schweikher’s Emerson Settlement House was completed on Chicago’s West side. It has since been demolished. Nonetheless, the Emerson Settlement House is a good example of the institutional, rather than residential, work that Schweikher did with Elting prior to WWII. This work was featured in the November 1939 issue of Architectural Forum. This work helps to secure Schweikher’s place in Chicago history more broadly, as Chicago has strong ties to the settlement house movement, particularly during the Progressive Era. The Glenview Cooperative Community was originally formed by seven buildings built for Northwestern University professors in the 1940s. 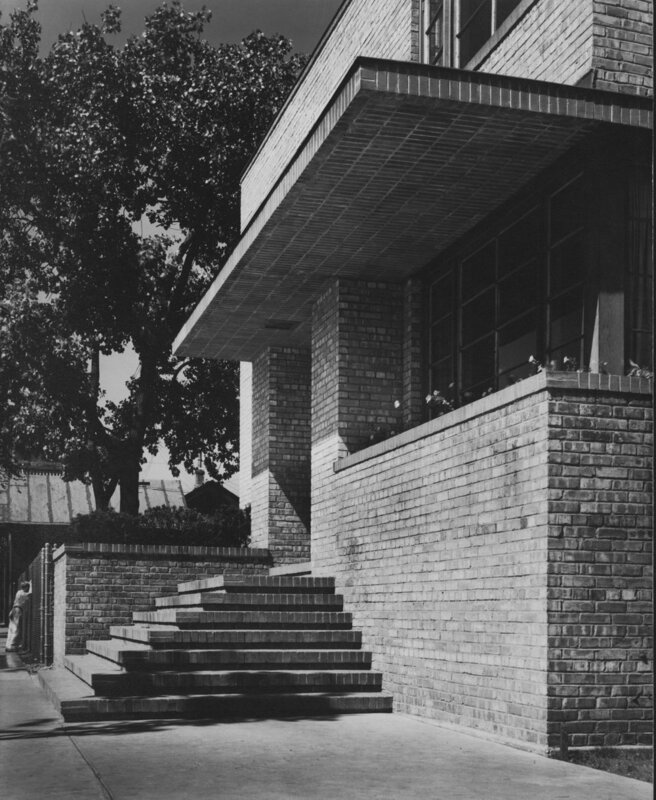 Photos from the time of construction—1942—show a number of similarities to Schweikher’s own home and studio, including the use of brick inside and out, and a number of built-ins used throughout the interior. The Glenview Co-Op Community is also located roughly one mile away from Fred Keck’s Solar Park. Keck and Schweikher often studied passive solar technology together in order to incorporate it into their designs.